Play a part in ensuring that students start the year off with the supplies they need, by participating in the 2015 Stuff the Bus campaign. 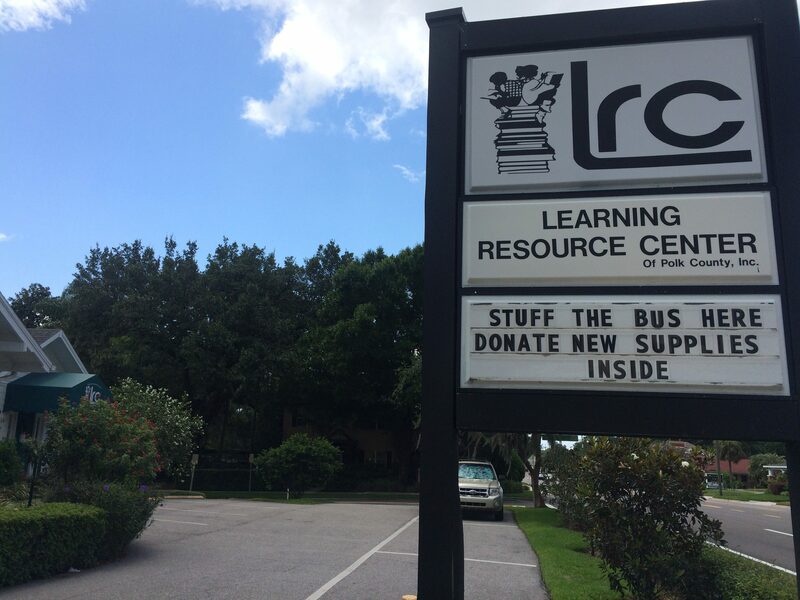 Join us in donating new school supplies at the Learning Resource Center of Polk County, Inc.
Stuff the Bus is Central Florida’s largest back-to-school campaign. The goal of this organized community effort is to collect new school supplies to distribute to public elementary schools in an effort to help students and families who cannot afford to purchase the supplies on their own. The Lakeland Kiwanis Club is sponsoring the area campaign they first began in 2001, marking its fourteenth year in Lakeland. 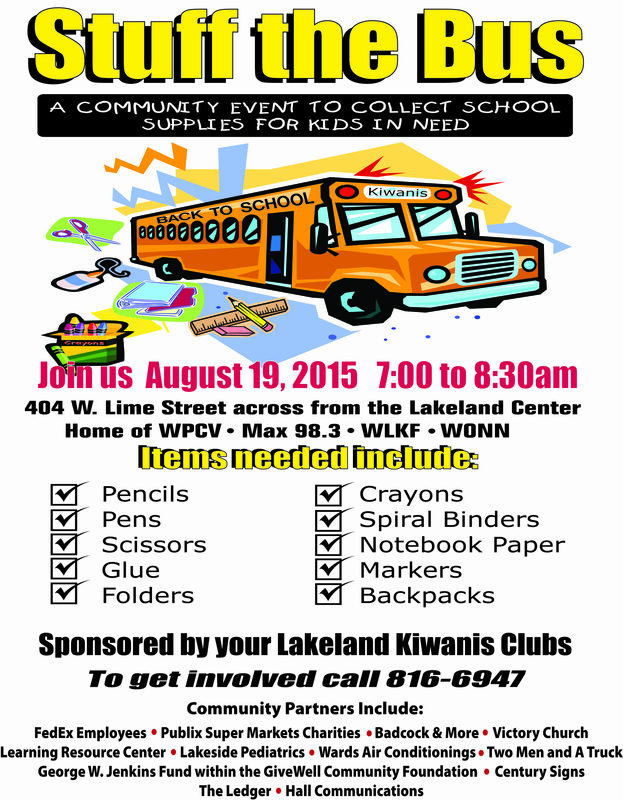 The Club will deliver the collected supplies to 28 public elementary schools within the city on Wednesday, August 19. Traditional school supplies such as pens, pencils, wide rule paper, folders with prongs, crayons, markers, backpacks, glue, and erasers are needed as well as copy paper, facial tissue, index cards, highlighters, hand sanitizer, zip lock bags, and pencil boxes. Bring your purchased school supplies to the LRC office located at 1628 South Florida Avenue in Lakeland between 7:30 a.m.-5:00 p.m. on Monday through Thursday and 7:30 a.m.-4:00 p.m. on Fridays by Monday, August 10. You’ll find a large “Stuff the Bus” box waiting to be filled in the lobby. The young students in need will appreciate your donation, and we know you’ll feel good about participating. Join us in this effort to help area students boost their self-esteem and start the school year off on the right foot! 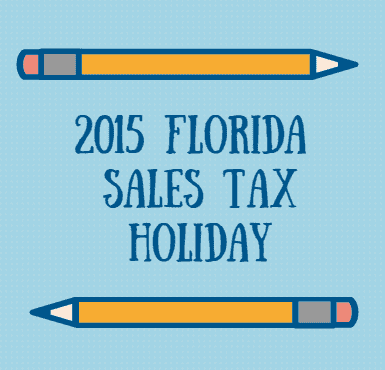 The 2015 sales tax holiday will begin on Friday, August 7, 2015 and continue through Sunday, August 16, 2015. That’s right! This year’s tax-free holiday will last for ten days, allowing shoppers ample time to purchase the products they’ll need for the upcoming school year without paying sales tax. As with the extended length of the tax-free period, other changes will take effect this 2015 holiday. Clothing and certain accessories up to $100 each will apply, while shoes are also eligible, but must cost no more than $100 per pair. Certain school supplies selling for $15 or less per item, such as pens, pencils, folders, and calculators will be eligible, but items such as staplers and computer paper will not be included. The first $750 of the sales price for computers and certain computer-related accessories (purchased for noncommercial home or personal use) will also be eligible. For those who prefer online shopping to in-store shopping, eligible purchases through the Internet during the sales tax holiday will also be exempt. While the stores will participate, the ten-day tax holiday does not apply to theme parks, entertainment complexes, public lodging establishments, and airports. For more on tax exempt items and qualifying purchases, please visit the Florida Department of Revenue’s site at http://dor.myflorida.com/Pages/default.aspx. 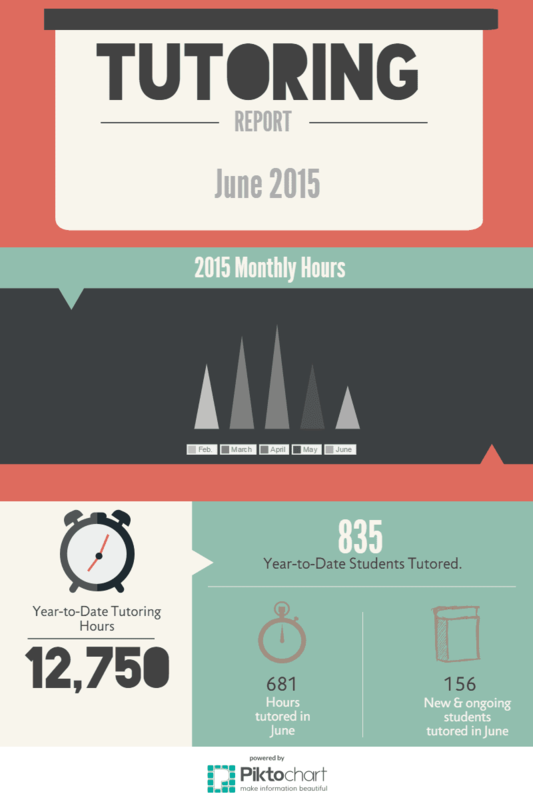 In the month of June, Learning Resource Center students received 681 hours of tutoring bringing the Year-To-Date Total to 12,750 hours. New and ongoing students tutored during the month of June equaled 156 students, with the Year-to-Date Total at 835 students. Many people may think solely of younger ones when it comes to focusing on learning gains and healthy habits over the summer. While it is valuable for the younger youth, we can’t forget about tweens and teens. It is important to keep all students of all ages learning over the summer. At the Learning Resource Center, we also offer summer programs for older youth that include SAT Test Preparation, ACT Test Preparation, College Success Planning, Study Habits of Successful Students, and One-to-One Tutoring. 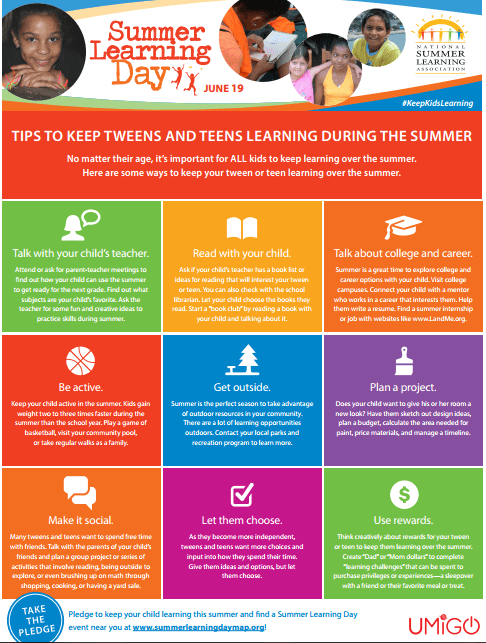 In addition to our summer learning opportunities, check out these fantastic tips below provided by the National Summer Learning Association to help keep the tweens and teens in your life learning this season. 1. 2015 marks LRC’s 40th year as a non-profit providing high quality academic programs designed to help all students maximize their learning potential. 2. LRC offers services to Polk County and other surrounding counties. 3. LRC employs over 500 certified teachers who provide countywide services to more than 4,000 students ages five through adult. 4. LRC is accredited by AdvancED’s Southern Association of Colleges and Schools (SACS). 5. Kindergarten through adult students can participate in year-round One-to-One tutoring designed to meet each student’s individual academic needs through personalized, convenient schedules. 6. LRC hosts 14 summer programs (in addition to One-to-One tutoring) geared towards kindergarten through high school students. 7. In summer 2015, LRC hosted nine kindergarten learning camps known as Camp READY! at locations in North and South Lakeland, Ft. Meade, Haines City, Bartow, Winter Haven, Lake Wales, Frostproof, and Poinciana. 8. On average, Camp READY! students who attend the full program demonstrate learning gains of SEVEN months in vocabulary development from pre- to post-assessment—quite an accomplishment for a five-year-old. 9. With support from United Way of Central Florida, grants, and generous contributions from private donors, LRC ensures that any deserving student who needs and wants academic help can receive it by offering scholarships and a Sliding Fee Scale. 10. LRC holds community partnerships with United Way of Central Florida, Polk County Public Schools, GiveWell Community Foundation, Publix Supermarket Charities, Heartland for Children, and the Lakeland Rotary Club. It’s almost that time again! While schools still have over a month before they’re back in session, it’s not too early to start thinking about donating to help out young students in need of supplies. Stuff the Bus is Central Florida’s largest back-to-school campaign. There are various ways you can play a part in the campaign. First, you could offer a donation of supplies. In addition to the traditional school supplies that are needed such as pens, pencils, wide rule paper, folders with prongs, crayons, markers, backpacks, glue and erasers, you may also donate copy paper, facial tissue, index cards, highlighters, hand sanitizer, zip lock bags, and pencil boxes. If this is the donation you’re willing to make, be sure to mark Wednesday, August 19 on your calendar as the donation day. Stop by Hall Communications, home of WPCV, Max 98.3, WLKF, and WONN, located at 404 West Lime Street in Lakeland between 7:00-8:30 a.m. to deliver your drop-off. The supplies will be delivered to the schools on the day of the event. 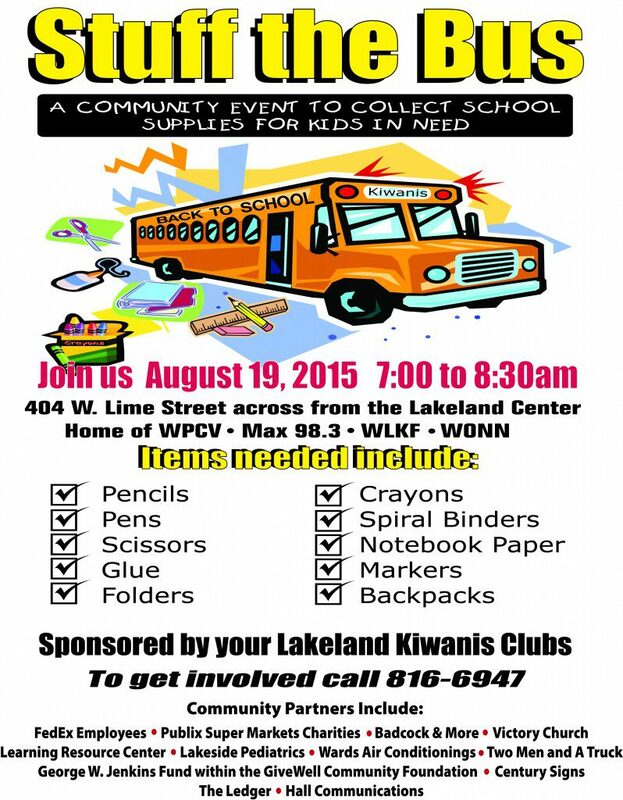 The Lakeland Kiwanis Club is sponsoring the campaign in Lakeland and will deliver the collected supplies to 28 public elementary schools within the city. You may also drop off supplies at the following Lakeland locations leading up to the August 19th event: Learning Resource Center, Red Elephant Pizza and Grill, Victory Church, Lakeland Association of Realtors, Regal Lakeland, and The Doggie Bag Boutique. Another, way to donate is by dining at North or South Beef ‘O’ Brady’s in Lakeland for lunch or dinner on Tuesday, July 14 and writing “Kiwanis/Stuff the Bus” on the back of your receipt. The event is called Beer, Wings and Onion, and the Lakeland Beef ‘O’ Brady’s will donate a portion of all of the marked receipts to the cause. You may also donate online through the Lakeland Kiwanis Charitable Foundation at https://secure.qgiv.com/for/lkcf/event/30541/. There, you may make a monetary donation of your choice towards Stuff the Bus. One last suggestion for getting involved is by contacting the Lakeland event organizer, Matthew Cantrall, at 863-816-6947 where you may be able to assist as needed. Please take the time to consider donating in one of the ways mentioned above. The young students in need of supplies will benefit from it! Middle school students will be able to obtain useful study skills that lead to achievement after attending Study Habits of Successful Students on July 13-17, 2015 at the Learning Resource Center of Polk County, Inc. Students in grades 6-8 can attend this profitable program to learn study skills and motivational strategies to become more effective learners. Throughout the course, students will learn and practice time-tested, efficient study strategies. Practicing beneficial study habits can play a crucial role in achievement gains. Study Habits of Successful Students will include specific activity-oriented lessons designed to help do just that. The lesson topics will include: Get Motivated, Listen Up and Take Notes, Set Goals to Achieve, Read Actively, Manage Your Time, Become Test-Wise. From getting motivated and setting goals to taking notes, managing time, and preparing for the test, this course is designed to cover all areas of studying to build confident, successful students. Register now for Study Habits of Successful Students taking place on July 13-17, 2015 from 9:30 a.m.-11:30 a.m. at the Learning Resource Center located at 1628 South Florida Avenue in Lakeland. The program cost is $145.00. Fee reduction may be available based on your family income, so be sure to ask about our Sliding Fee Scale. Register online at LRCPolk.com/programs/study-habits-of-successful-students, by phone at 863-688-9477, or in person at the Learning Resource Center. This interactive study skills program was created to motivate and prepare middle school students to become effective learners. When your student gives it a try, we are sure they will see progress on their tests to come! LRC’s commitment to your child’s success ensures that your student will receive quality instruction from certified, highly-qualified teachers in a small group setting of no more than 10 students per class. Get the “competitive edge” with college success planning and the Learning Resource Center. High school students in grades 9-12 should consider this course to not only gain the skills needed for college, but to ensure that they are well-equipped for the next major step of their lives. Get the Competitive Edge…College Success Planning provides participants with study skills and motivational strategies preparing them to become more effective learners before advancing to college. Students who attend will learn and practice time-tested, effective and efficient study strategies, as well as concrete techniques to get the competitive edge necessary for college. The course provides small classes with activity-oriented lessons to help students develop the study habits of successful students. This course also offers added benefits of quality instruction from certified instructors and personalized Learning Styles Inventories to help each student succeed. The topics that will be covered include: test-taking, building memory, reading and note-taking with a purpose, time management, and successful transitions in addition to other crucial study skills. All of these skills are not only essential for college, but are both useful before and after college, as well. Get the Competitive Edge…College Success Planning will take place Monday, July 13-Friday, July 17, 2015 from 1:00-3:00 p.m. at the Learning Resource Center located at 1628 South Florida Avenue in Lakeland. The cost of the program is $145.00. Be sure to ask about our sliding fee scales based on gross family income. Register online at lrcpolk.com/programs/college-success-planning or by calling LRC at 863-688-9477 to reserve your place and start your journey on the path to success! 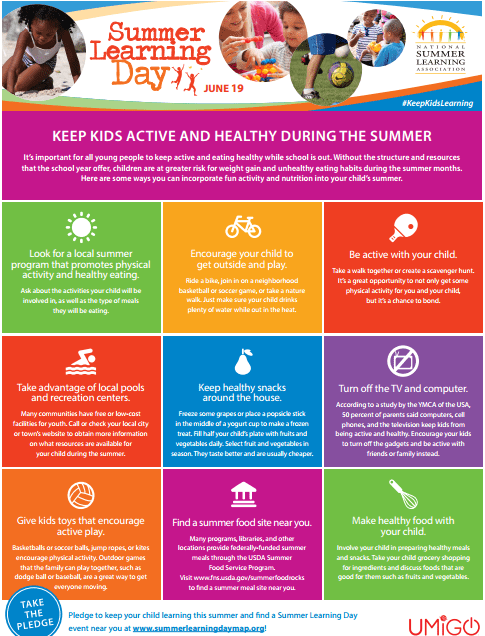 While we agree that it is important to #KeepKidsLearning over the summer, it is also necessary to note the importance of keeping kids active and healthy during the summer months. Without the structure and resources of the school year, children are at a greater risk of unhealthy habits during the summer months. Thanks to the National Summer Learning Association, here are nine ideas for keep kids both active and healthy this season.